It is 1913, and those who follow the news closely can see the world is teetering on the brink of war. Jack McColl, a Scottish car salesman with an uncanny ear for languages, has always hoped to make a job for himself as a spy. As his sales calls take him from city to great city Hong Kong to Shanghai to San Francisco to New York he moonlights collecting intelligence for His Majesty s Navy, but British espionage is in its infancy and Jack has nothing but a shoestring budget and the very tenuous protection of a boss in faraway London. He knows, though, that a geopolitical catastrophe is brewing, and now is both the moment to prove himself and the moment his country needs him most. 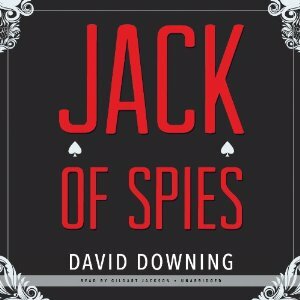 I expected a spy novel that takes place right on the brink of WW1 to be more exciting/interesting than Jack of Spies was. It felt more like a romance than a spy novel, which would have been alright had it been marketed as a romance, but it wasn’t. Even at that it wasn’t a believable romance either. I just wasn’t impressed. Jack’s a good guy and a mediocre spy. It’s a dangerous game he’s playing, but the danger never seems real, even when he’s almost killed. It just doesn’t feel urgent. I never cared about him, and sometimes I just wanted to roll my eyes. Maybe I just don’t like a cheesy romance messing up a potentially good book. The actual espionage portions had potential, if he hadn’t been brooding over how it was going to effect his relationship with the woman. Because of course her family’s involved. Jackson was okay as a narrator. I especially appreciated the accents he used, both for the characters and when Jack emphasized his Scottish background rather than his Oxford English. I do wonder if his reading style was part of the reason it didn’t quite seem as thrilling as it could have. Maybe it was bit matter of fact, which I prefer to overly dramatic, but maybe there’s some middle ground. I guess this is the first in a series. I don’t think I’ll be picking up the second. It did make me add an Alan Furst book to my to-read list. Do you have any favorite spy novel authors?